Haight Village's own Maria Ludeke wrote a paper for school when she was 12 years old. We have included Maria's paper just as she wrote it, standing on its own as a testament to the value of Haight Village and the preservation of our history. Established as Rockford's first historic district, Haight Village is a prime example of an older, downtown neighborhood that can be a viable place to live! The thirteen block area is bounded by Walnut Street on the north, Kishwaukee Street on the east, the Chicago and Northwestern Railroad tracks on the south, and Madison Street on the west. In 1834, Germanicus Kent, Lewis Lemon, and Thatcher Blake settled on the west side of the Rock River. Haight Village was named after Daniel Shaw Haight, the first person to build a home on the east side of the river. Mrs Haight and her sister, Miss Carey, were the first white women to settle in Rockford. The area was originally called "the Barrens" and contained a large stand of white oaks which served as Haight's hunting preserve. His original purchase for this 80 acre plot was at $1.23 per acre. He built his first home on this land in 1835, a cabin. In 1837 Haight built a house on the corner of East State and Madison Streets, in which the first session of the Circuit Court was held. The house was moved and stood for many years on the northeast corner of South Second and Walnut Street until it was razed around 1906. In 1839, Haight built a small brick house on the plot of land upon which now rests the Wheeler home at 228 S. 1st St. In 1842, Haight built a permanent home for himself at 525 E. Jefferson St. Unfortunately, the Haight Home was razed in 1966 and replaced with a parking lot for Robert LaGrange's Rockford-Park Rent-All. Rockford-Park Rent-All was located in the Haight Home for seven years and due to business expansion, moved into a steel building and part of an old house that was next to the Haight Home The county's first election was held at Haight's cabin in 1836. Haight was the county's first sheriff and also served as the city's first postmaster until 1841. In 1844, Daniel Haight and others obtained the financing to build the first bridge across the Rock River. The bridge was opened on July 4, 1845 and was crossed by 2,000 people on the first day. The first school in Rockford was built at 110 S. 2nd Street. The school, a little log house, was a private institution where classes were taught by Eunice Brown. It opened in July of 1837. Also in 1837, the Kremble log cabin was built near the northwest corner of South 1st Street and Walnut. Originally, the west settlement was known as "Kentville," and the east settlement was known as"Haightsville." These two settlements joined together in 1839 as "Rockford," with a population 235. The first county fair was held in a grove at Oak and 1st Streets in 1841. In 1849, Anna Sill formed Rockford Female Seminary in the carriage house and barn of Gilbert Woodruff, a prominent pioneer citizen, on South 3rd Street. Rockford Female Seminary later became Rockford College. Some of the early Haight Village homes were built in the 1840s; the majority were constructedfrom 1850-1890. Early records show a vital diversity existed within the social fabric of the neighborhood. This is reflected in the architectural styles and sizes of homes... large and elegant mixed in among more modest dwellings. Variety still exists today in age, occupation, skills, and leadership. In 1886, the north half of Haight's original tract was divided and sold. The north half was offered at a public sale to settle an estate. It was purchased by William Brown and Frank Ward, both early mayors of Rockford. 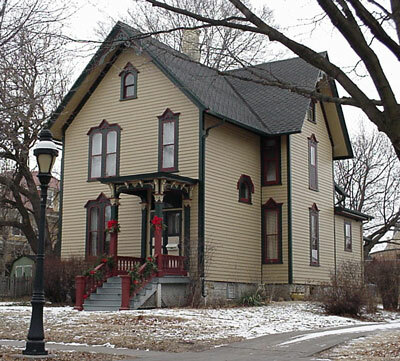 Ward built a home at 308 S. 3rd Street and Brown built a home for his daughter at 614 Oak Street. After Brown's death in 1891, his heirs deeded the property at 304 S. 3rd Street to Ward on the consideration that he not build a barn or a fence on the property and block their view of the West. Four of the city's first ten mayors came from Haightsville. Of those four, the home of Mayor Seely Perry at South 1st and Grove streets was razed in 1964 to make way for a parking lot. Historic Districting is a zoning device designed to preserve and protect areas. Haight Village Restoration Society is a very active organization, made up of people who appreciate the unique architecture of the past, and want to preserve it. It is also very actively involved in establishing a growing, viable neighborhood. Because it is an Historic District, low-interest loans are available to home buyers, and also to owners for repairs. What you see here is not "deterioration," but "active growth"! The churches in the neighborhood also reflect this growth. The Haight Village Restoration Society was organized in the Spring of 1977 to organize a campaign to save Rockford's oldest, intact neighborhood. Not only did they eventually get Haight Village placed in the National Register of Historic Places, but they were able to get a local ordinance set in place to recognize the 13 block area as a historical district. The local ordinance was the primary objective of the Society so that new construction, additions, and alterations, etc. could be regulated, thus preserving the historic integrity and significance of the neighborhood. Haight Village became Rockford's first Historical District in 1981. A large boost to the area's rehabilitation came in 1981 when First Rockford Community Development Corp, a subsidiary of First National Bank & Trust Co. bought 10 rundown houses in the 300 block of S. 2nd St. Restoration had been completed on five of them by October of 1983 and were sold along with two more completed by 1985. Haight Village received official notice of our listing in the National Register on Friday, December 11, 1987. At the time, there was only one other district listed on the Register - East State/Midway area. Haight Village received national notice when one of our houses was featured in a six minute segment of Restore America on The Home & Garden Television channel which aired Sunday, October 17, 1999. Enjoy the history you see today. Enjoy the old-fashioned street lamps and old brick crossings. We hope you appreciate the Haight Village neighborhood as a dynamic, growing part of Rockford.